Founded in 1988, the Washington State Ridesharing Organization (WSRO) is a group of transportation demand management (TDM) professionals and employee transportation coordinators (ETCs) in Washington state. Our mission is to encourage policy makers, employers, and commuters to support the use of transportation alternatives to driving alone. Our goal is to reduce air pollution, traffic congestion and energy consumption throughout Washington state and the Pacific Northwest. WSRO was incorporated as a 501c(6) non-profit organization in 1989. WSRO hosts at least one two-day conference each year (alternating between locales in eastern and western Washington), is the primary sponsor of the annual Wheel Options campaign, and bestows recognition awards on the individuals, groups, and organizations that exemplify the commitment to our mission and to the concept of smart commuting. WSRO offers its members reduced conference registration fees, access to members-only training and resources, voting privileges, and much more! Whether your focus is advocacy, policy implementation, or planning development (or all three! 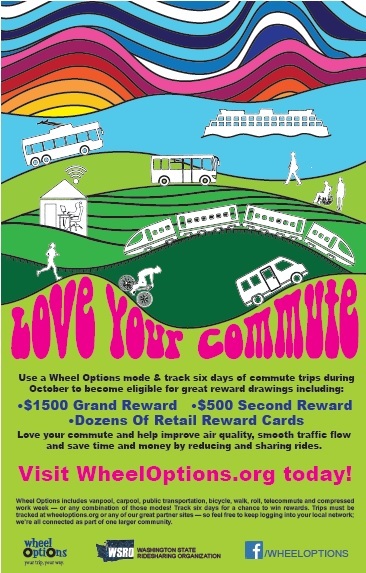 ), if you promote the use of smart transportation options, we'd love for you to join us! Thank you to the Washington State Department of Transportation for their financial support!